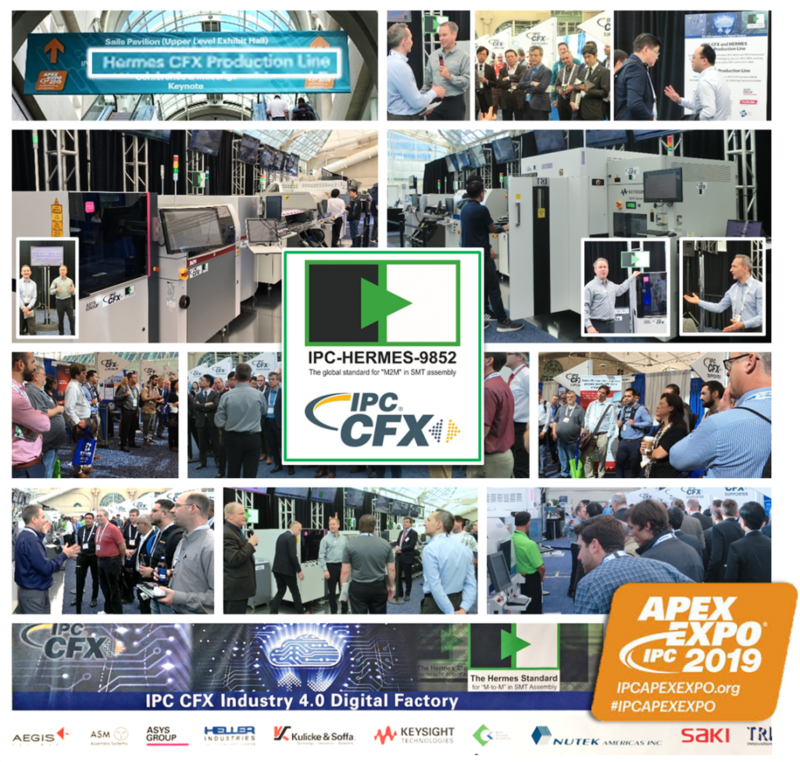 IPC APEX Expo marked another milestone for The Hermes Standard IPC-HERMES-9852. In a combined show together with IPC CFX multiple vendors presented a joint assembly line, giving a strong statement regarding seamless integration of leading edge assembly technology. Mainly moderated by Aegis and ASM, the show impressed more than 300 registered visitors of more than 80 companies with smooth horizontal (“Hermes”) and vertical (“CFX”) integration. Beyond the mere technical aspects, the event was a clear evidence of how successful the members of The Hermes Standard Initiative had worked together bringing IPC-HERMES-9852 forward. Companies that have comitted equipment and manpower included Asys (laser marker), ASM (screen printer), Saki (SPI), Kulicke&Soffa (placement system), Heller (reflow), Nutek* (conveyors), Koh Young (AOI), TRI (AOX), Keysight (ICT). We wish to extent many thanks to everybody participating.Unfortunately, Nutek had issues with bringing their equipment in because of customs keeping it for longer due to the ongoing tax disputes. * Unfortunately, Nutek could not bring in their equipment in time due to issues at the customs office during the dispute about import taxes.